We here at ASEdeals.com take pride in the wide variety of customers we’ve supplied equipment to over the past 14 years. We’ve supplied lifts to may different countries and to many different types of customers, from Hollywood movie sets, such as the Denzel Washington, John Travolta hit; The Taking of Pelham 123, to Universal Studios Resort in Orlando Florida, to many, many different military locations of the US Army, Navy, Air Force, Marines and Coast Guard. We also supply products to some of the premier sports and exotic car auto shops in the most exotic locations. One such repeat customer is Rene Telle from Telle Auto Works in Nassau, Bahamas. They are the premier German / Mercedes-Benz specialists on the Islands. Here is what Rene has to say about ASEdeals, ” We are Nassau, Bahamas premier Mercedes-Benz specialist shop. I purchased a two post lift, BendPak Lift from ASEdeals.com several years ago because of their great reputation for quality. I was not disappointed. When it came time to purchase another, I came back to ASE because of their great service and attention to detail. They always take great care of my needs. We notified you previously that BendPak was having a major price increase beginning on July 1st. This is just a reminder that that you have only a few more days to take advantage of the current low prices. Many models will be going up a significant amount. Don’t wait. If you were considering a Car lift, a tire changer, spray wash cabinet or air compressor, now is the time. June 30th is your last day to get in. BendPak Lifts are the best in the industry and we’ve explained in details in many other posts exactly why that is. They are one of the premier names in the automotive equipment industry with over 40 years in the business. We’ve been carrying their products for over 14 years with tremendous success. Our customers are extremely happy with their products and so are we. check them out today. Should you get a reciprocating air compressor or a rotary screw air compressor? This is a common question among shop owners, mechanics and the home DIY crowd. The answer depends on your needs and your budget. The more popular style of compressor is a 2 stage Reciprocating Air Compressor. They are reliable, time-tested and put out a good amount of air. They are also quite affordable. They come in many sizes and have been a staple of any auto shop garage for decades. The main point of getting a Rotary Screw Air Compressor is that it is super quite. They typically make about half the noise of a traditional reciprocating air compressor. That can be important in any shop, but especially in a smaller shop. The premise of a rotary screw compressor is air enters a sealed chamber where it is trapped between two contra-rotating asymmetrical screws. As these rotors inter-mesh, they reduce the volume of trapped air and deliver it compressed to the proper pressure level. Combined with continuous contact cooling, the rotary screw air compressor is able to operate with temperatures approximately half of those generated by a typical reciprocating piston compressor. The lower temperature enables the compressor to operate in a fully loaded continuous duty cycle, 24 hours a day, 365 days a year. This ability to run for extended periods of time alone makes the rotary compressor ideal for demanding industrial applications. They will also put out more air than a comparably sized reciprocating air compressor. It will also product less heat, which means less moisture build up in the tank, along with greater lift expectancy. The main reason people stay away from rotary screw compressors is the price. Rotary screw compressors typically cost significantly more than their reciprocating brethren. Reciprocating compressors are significantly less money, which is the main reason you will find many more reciprocating models out there in shops across the country. We’ve had many noteworthy customers over the past decade. Some of them include Boeing, Alcoa, Lockheed / Martin, Cummins, Pratt & Whitney, UPS, Frito-Lay, and many more corporate entities. We’ve also sold to many, many government agencies as well, including state and local governments, Federal government agencies, and nearly every branch of the military. One recent corporate customer is Continental Airlines. 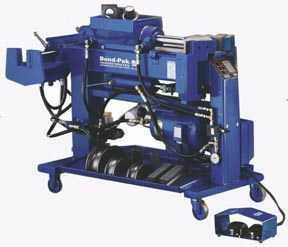 They purchased one of our BendPak Exhaust Pipe Benders for their auto shop. Said Sean Carroll of Continental, ” When we needed a tube bending machine for our Newark, NJ GSE auto shop, we chose the BendPak bender because of their known quality. We chose ASEdeals.com because of their reputation and our long term relationship with them”. They have purchased other equipment from us in the past, including one of our Ranger Tire Changers back in 2008. The BendPak exhaust tube benders are the best in the industry. They have fully digital models that are programmable and can replicate virtually any bend to copy and OEM parameters effortlessly. There is also an optional computer card system that contains over 3500 cards on CD that covers over 10,000 applications. All the popular dies are included for pipe up to 2.5 inches. The 3 inch die package is sold separately. Warranty is five years on structure and one year on hydraulics. Contact us today with any questions at 800-229-6218. Customers who purchase their Car Lift from ASEdeals.com usually install their lift themselves. We estimate that nearly 85% of our customers will perform the assembly by themselves, or with the aid of a few friends. The instructions come with the lift along with the Owner’s Manual. There is also a tech support phone line if you have questions or run into a snag. They will spend as much time on the phone with you as necessary. All the mounting hardware comes with the lifts as well. They even come with shims if your floor isn’t level. You should have some technical background to attempt installation yourself. If you’re not up for installing it yourself, don’t fret. We have a nationwide network of installers that are ready and capable to install it for you. These are professionals who have typically been in the business for years and know what they are doing. These installers can also receive the lift for you if you do not have the ability to unload the lift at your location. So they can receive it, bring it out and install it for a fee. Fees typically range from $450 to $700 for a 10,000 lb two post lift or a 9 to 14000 lb four post lift. Fees will vary, depending on various factors such as how far they have to travel, and what is expected of them. For instance, if the installer has to supply the hydraulic oil, you would expect to pay about $40 more than if you were to supply it. Some lifts are more labor involved than others. For instance, an alignment lift has special considerations and it is recommended that you have it professionally installed. Whether you install your automotive lift yourself, or have it installed by a pro, there’s no doubt that a lift is a rewarding piece of equipment to purchase. Check out one of our customer’s home-made videos below for a better idea on what is involved on a typical four post lift installation. ASEDeals.com recently sold a BendPak Lift to Universal Studios Orlando Resort. They purchased a BendPak HD9XW four post lift. This is one of our most popular lift models. It is a 9,000 lb. capacity lift that is the extra wide, extra long, extra high lifting model. Gregory Steirer from Universal’s maintenance department said, “We needed a lift for our maintenance department, and this lift meets our needs perfectly”. The quality and reputation of BendPak Lifts makes our job here at ASEdeals.com so easy. Customers who have done any research at all already know that BendPak is tough to beat when it comes to quality and features. Plus, they are actually quite affordable when compared to other high-end quality name lifts. This isn’t the first time Universal Studios has turned to Automotive Service Equipment for their shop equipment needs. They also have our Ranger DST1200 Wheel Balancer. This is our most popular wheel balancer with years of reliable service. If Universal Studios maintenance department relies on ASEdeals.com, so should you. BendPak has probably the widest range of different types of lifts out there. With over 40 years of experience, it’s no wonder why. While they are most well known for their two post lifts and four post lifts, they have all kinds of other specialty lifts. They have two different low rise Auto Lifts. The LR60 is their standard low rise lift. It raises to a height of 26 inches. It’s lowered height is 4 inches. This lift is perfect for body shops, brake shops, or even home hobbyists who just like to tinker. It allows access to most of the vehicle for service purposes, although there will be limited access to the very underside of the vehicle. You will have access to most of the engine compartment, and to the rear of the vehicle, however there will be no access to the center of the underside of the automobile. Home, hobbyists like it because it gives them a car lift that is nearly a full service lift, and yet, doesn’t take up any floor space out of their garage, considering that they can park their car over it when not in use. There is also a portable version, the Model LR60P. This lift has wheels that are attached to it, and a handle which allows it to be wheeled around. This is a very popular, and convenient feature. Bend Pak is always working on new things, so stick around for new products. Shop owners – How many times have you had a leak, but you couldn’t locate it? Didn’t you wish you had a piece of equipment that could locate it? There are numerous leak detectors out on the market today, but they have many shortcomings. Many don’t have an infinitely adjustable pressure control, so you only have a limited amount of pressure settings. 1 psi is just not enough pressure to pinpoint those hard to find Evap leaks, oil, air and fuel system leaks, coolant system and of course, vacuum leaks. 1 psi just doesn’t push the smoke through the system being tested at a high enough pressure, frequently leading to misdiagnosed troubles, and therefore – comebacks, the most dreaded thing an auto repair shop owner can see. Well, worry about comebacks no more. The ELF-1 Smoke Machine / Leak Detector by RTI is designed specifically to find those hard to find, recurring leaks that can cause you to stay awake at night. And anything that saves you this kind of time and keeps you from spending hours trying to diagnose a problem is a huge money saver for your shop. Worried that you can’t fit it to various systems? Don’t worry. It comes with various stoppers and adapters to fit most systems. Worried that the smoke charge will run out in a short period of time? Don’t worry. The smoke charge is guaranteed to last at least two years, and will probably last 5 years under normal shop use. Worried that it won’t be compatible with many automotive systems? Don’t worry. The ELF-1 is adjustable from 1-15 psi, so you determine what pressure to set it at, based on the system being tested and the manufacturer’s specifications. And don’t forget, it’s manufactured by RTI. One of the best names in the automotive shop equipment business. It has a one year warranty, and parts are always available. The refills are only around $80 too, so you won’t break the bank on them. Think of the time saved and the productivity and get going. You can’t afford not to get one of these. You are currently browsing the Car Lift Blog blog archives for June, 2010.